Issues related to the sustainable development of livestock production. Strategies for sustainable development of animal agriculture - an FAO perspective. Sustainable animal agriculture: The role of economics in recent experience and future challenges. Investment for sustainable livestock development in developing countries. Regional policies on food and agriculture and their impact on the advancement of livestock production in the developing countries. The impact of livestock development on environmental change. The conservation of genetic resources in the developing countries - A practical way forward. Practical technologies and options for the genetic improvement of livestock in developing countries. Policy issues in livestock production in arid regions and the management of extensive grazing lands. Practical technologies to optimize feed resources utilization in reference to the needs of animal agriculture in developing countries. Practical technologies for the optimal use of tropical pastures and rangelands in traditional and improved livestock production systems. Practical technologies for mixed small farm systems in developing countries. Cost-effective disease control procedures and animal health management in animal agriculture in developing countries. Partnerships: The effective harnessing of research for the advancement of animal agriculture in developing countries. 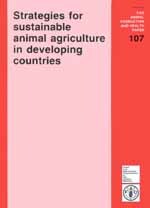 Education and training needs of animal agriculture in developing countries. Strategies for effective extension services to guide the advancement of animal agriculture in developing countries. Farming systems methods in the planning, implementation and monitoring of sustainable livestock development projects. The role of state sponsored and co-operatively organized support services in milk production, processing and marketing in developing countries. The role of state sponsored and co-operatively organized support services in meat production, processing and marketing in developing countries. Lessons from field development of livestock projects with special reference to large ruminant production. Lessons from field experience in the development of poultry production. Toward sustainable poultry production in Africa. Lessons from field experience in the development of monogastric production.